Chris Pearce was in and out of the side between the loans in his last Burnley season as Andy Marriott was followed by Mark Kendall and Nicky Walker before 2nd choice David Williams finished the season. Williams had in fact played against us earlier in the season whilst on loan to Rochdale. 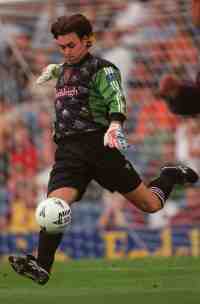 With Pearce released the only certainty during the summer of 1992 was that manager Jimmy Mullen would bring in a new keeper. Incredibly he didn’t and David Williams started the season in goal. A number of keepers had been linked with us and the name most oft mentioned was that of Sheffield Wednesday’s Marlon Beresford. He even got as far as attending the annual cricket match against Burnley Cricket Club but nothing materialised. We started the season with a win and a defeat but just before the third game, at home to Rotherham, Mullen finally got his man when he paid Wednesday around £100,000 for his services. He had an excellent debut against the Millers as we drew 1-1 with our goal scored by John Deary. The line up for his debut was: Marlon Beresford, Ian Measham, Joe Jakub, Adrian Randall, John Pender (Andy Farrell), Mark Monington, Robbie Painter, John Deary, Graham Lancashire, Adrian Heath, Steve Harper. A week later and he saved his first penalty although we were soundly beaten 3-0 at Chester, there were to be many more penalty saves. Although he hadn’t previously played for Sheffield Wednesday, his first club, these were not his first appearances in the Football League. In loan spells he had played for Bury, Northampton and Crewe. 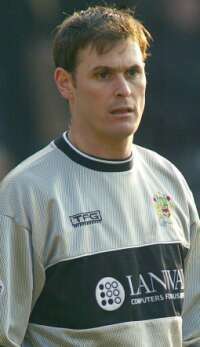 His first season for the Clarets was a good one for both him and the club as we established ourselves in the new Second Division but if he was feeling complacent then he got a shock on the last day of the season when he had to leave the field injured at Stoke after a clash with future Claret Kevin Russell. Central defender Mark Monington went in goal and had a superb game as the Clarets fought out a 1-1 draw. But it was Beresford in goal for the start of the following season and if his first season was a good one then his second was even better. He was proving to be an astute signing by Mullen and was in sparkling form on a number of occasions as the Clarets reached the play off finals at Wembley and won promotion with a 2-1 win over Stockport. He was by now a crowd favourite but 1994/95 proved to be a poor season for the Clarets as we were relegated after just one season in the 1st Division. Not only that Marlon was sent off twice, both in defeats away from home at Oldham and Portsmouth and that let in new keeper Wayne Russell for a few games. Despite the relegation, and even a couple of spells out of the side, Marlon was still our number one keeper and in fact Russell left, released by Heath at the end of the 1996/97 season. As the Clarets struggled under Waddle it was a tough time for Marlon, he had some less than impressive games. In fact on the last day of February 1998 he gave a goal away in the last minute at Carlisle as we went down 2-1 but what happened next could hardly be believed. A week later I arrived at Walsall and just as I went through the turnstiles I was told that goalkeeper coach Chris Woods was in goal because Marlon had been sold to Middlesbrough. This was obviously wrong, there had been no suggestion of it and Waddle had named him in the side. But the information was correct, he had been sold that morning for some £400,000 after indicating that he would turn down any new offer. He was out of contract at the end of the season. After 240 league games for the club, and almost 300 games in total his Burnley career was it seemed over and he moved on to the Premiership with Middlesbrough as they too faced relegation. Because of other keepers at the Riverside he was never able to establish himself there and played in just 10 league games for them. He did have a loan spell back at Sheffield Wednesday where he played four games before signing for Wolves on loan at the beginning of last season. He was there as cover and in fact during this period he made a Turf Moor return for Wolves in a reserve game. Little did he know just what would happen around four months later. Nik Michopoulos was injured (calf) during our latest embarrassing cup defeat at Cheltenham and after his replacement that afternoon, Luigi Cennamo, did a good impression of a rabbit caught in car headlights Stan turned to Marlon and brought him in on loan. His second Burnley debut was against West Brom and he received the most incredible reception from the Burnley fans as he came out and made his way down from the tunnel to the Bee Hole End. He had a mixed time on loan, having some good games but also giving away one or two crucial games. He would though have stayed until the end of the season but for being called back by Boro. There was growing speculation that he would be back for the following season and it seemed so when he started training with us. But it was not to be immediately and as Burnley made a dreadful start Marlon was playing 3rd Division football for York. By September though he was back at the Turf and that brought a change in fortunes with an initial good run. He signed for a month initially and despite there being a contract on offer until the end of the 2004/05 season he continued to sign monthly deals despite saying he wanted to stay. Some supporters were not happy with this and started to question his loyalty although continuing to appreciate the better performances. Perhaps his best two performances this season came in away cup ties at Huddersfield and Brentford. He kept clean sheets in both games and won almost single handedly ties against Spurs and Fulham and helped to swell the club’s coffers. But I’m sure he will live to regret not signing that contract because a string of poor recent performances firstly cost him his place in the side and then saw the offer of a deal taken away. Now, just as was the case a year ago, he finds himself without a club and could well find it even more difficult to find a new club than he did a year ago. But the last month, and in particular the two home sevens, should not be allowed to get in the way when we come to say thanks for Marlon. There have been certainly more good games over the years than bad but after a total of 287 league (or 349 league and cup) appearances he now says farewell to Turf Moor for the third time. He played alongside Steve Davis and Gordon Armstrong along with some of the youngsters on Sunday despite knowing he was leaving. He and Davis can boast over 600 Burnley league appearances between them. They deserved to go out with a win and Marlon surely deserved to go out with a clean sheet. We don’t know who will be in goal next time we take to the field, it won’t be Marlon, but we would certainly be happy to hear that he has found himself a new club.